Vitex is an ancient Latin name which is derived from Vieo meaning to bind. This is in reference to the flexible stems of this species. Lucens means bright shining or clear which describes this trees foliage. The Puriri was first discovered in Tolaga Bay New Zealand in 1769 by Sir Joseph Banks who accompanied Captain Cook on his initial voyage to New Zealand. Early settlers also discovered this tree and promptly cut them down to make railway sleepers, fence posts, house blocks and bridges it is a very durable timber and some of the early Puriri posts are now being recycled to make rustic furniture. Vitex lucens has bright green foliage and will maintain a shrubby like growth initially, later developing into a large round headed tree. It develops numerous rosy 2.5 cm flowers in panicles, followed by bright orange berries. It is evergreen and can grow up to 12 to 18m in the wild. The Puriri is not difficult to grow and can be grown from cuttings grown in May (mid winter) providing side shoots are taken from low down on the tree. If you get a small section of trunk with your cutting as mentioned in the demonstrations section under cuttings you should get a 100% take. The bark on the Puriri looks quite aged even on a relatively young tree. It is quite difficult to get any of the traditional styles from this tree, the large palmate leaves are a problem and wiring is difficult. The bark is attractive and looks quite old even on a relatively young tree. 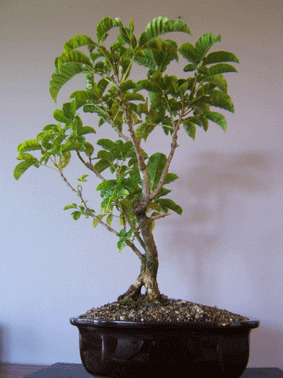 I have been training my tree for two years now and have managed to get some leaf reduction; I am looking at getting another tree on the go and experimenting with defoliating the tree early summer and seeing how the new growth returns. I will let you know.Puriri require plenty of water and a regular feeding program to maintain leaf colour. They will soon let you know if the require feeding or a repot the colour drains from the foliage. They enjoy a sheltered spot with a little bit of shade when young. New foliage will sprout form old wood and it is quite easy to pinch out the growing tips to encourage this. I have had my tree for three years and have not yet had a flower but I am ever hopeful. I have had no problems with pests apart from the odd hole in a leaf which I can live with. I have seen small trees attacked by aphids on the new growth and some fairly stressed looking plants. This is usually because they have been used as amenity plants in schools or subdivisions where they have been planted in areas with no topsoil and exposed to the wind and sun with only a flimsy stake for protection. A sheltered spot and good soil will reward you with a healthy attractive addition to your collection.